Tickets are still available. Here’s how to attend the Tour is you don’t have them yet! Download the official Tour map by clicking here. Alternative download location is here. Get tickets online by clicking here. Proceed to any Tour home to start your Tour. Enjoy the day supporting local San Diego architecture and design. 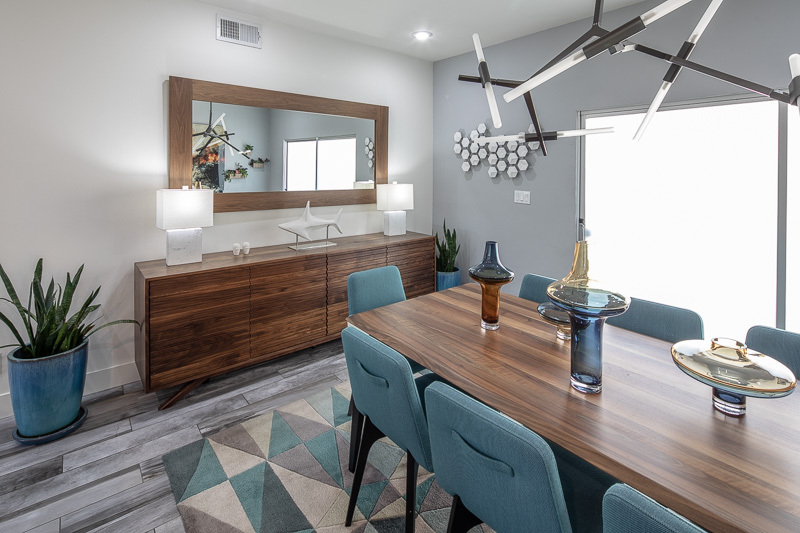 Starting at 4pm on Tour day, join us for the D3 Home Afterparty, where your wristband gets you 10% off storewide in San Diego’s best spot for modern furnishings, lighting, accessories and more, so click here to make your shopping list now! Thanks to our media and community partners! Presented by Nakhshab Development & Design, Inc. Presented by Duende DNC inc. Presented by Stone Lion Properties, Inc. Presented by Tourmaline Properties Inc. 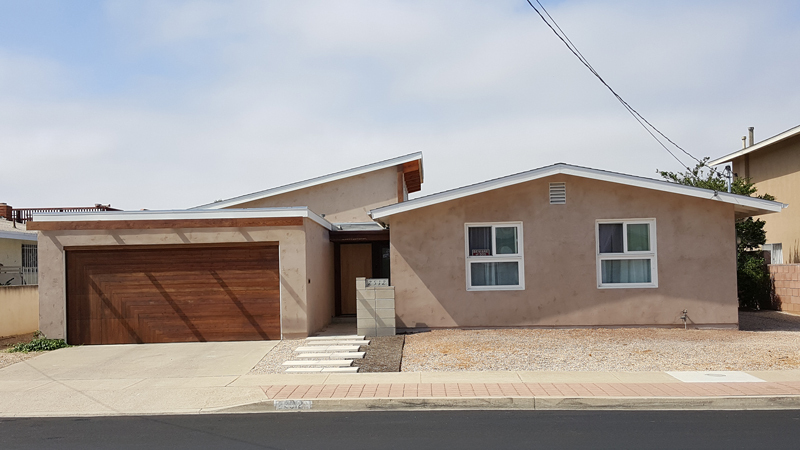 This 2-floor sleek modern architectural home features three-bedrooms, three-full baths. Mezzanine style balcony with 24ft ceilings. Porcelain Italian flooring. full sun facing windows providing lots of natural light. 2 Private decks with fireplaces. 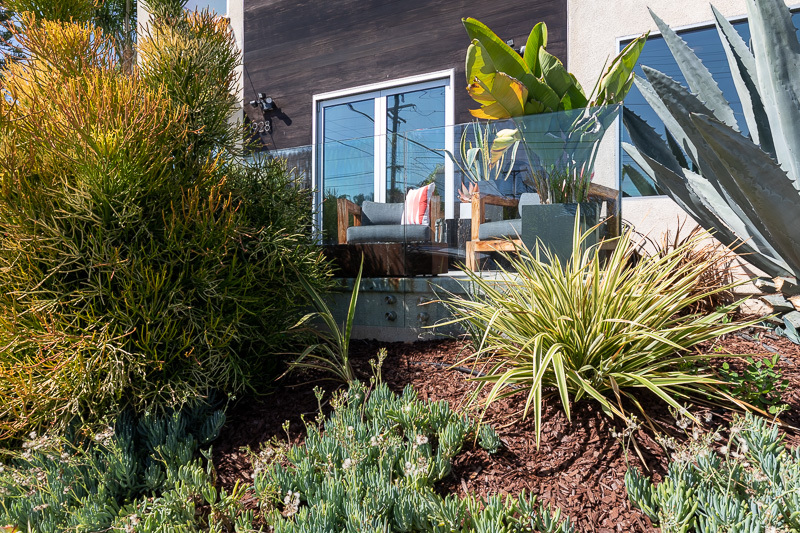 Outdoor living area with drought resistant desert landscape. 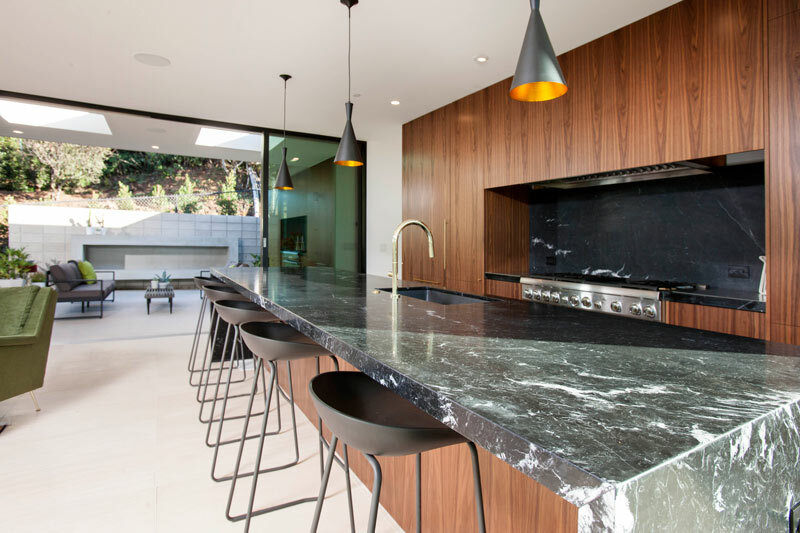 Renovations and design of the home were completed by D. Diehl Designs. 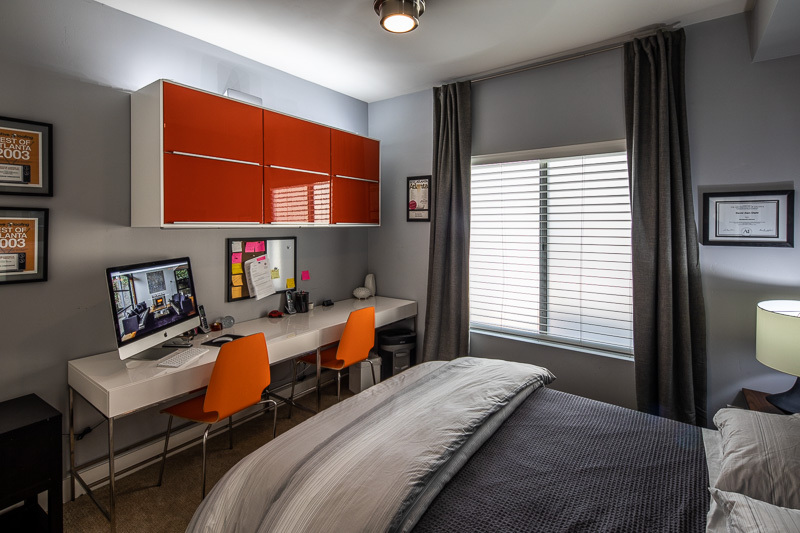 Design and Build: Nakhshab Development & Design, Inc. 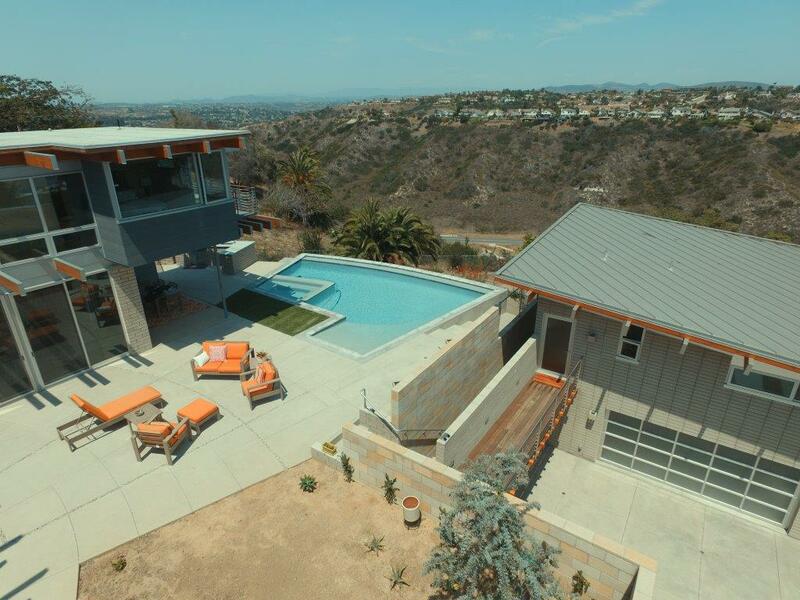 This residence is a 4132 square feet residence in Mission Hills in San Diego. 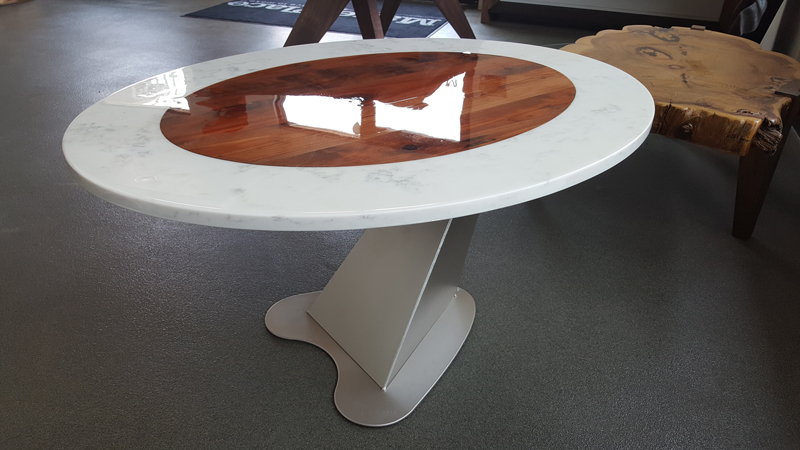 It was inspired by mid-century modern aesthetic and the luxuries that it can bring to family living. As many of NDD’s projects, it encourages multi-generational living, with a guest quarter in the lower floor. It has a high-ceiling great room designed for entertaining guests and enjoying peaceful family time. 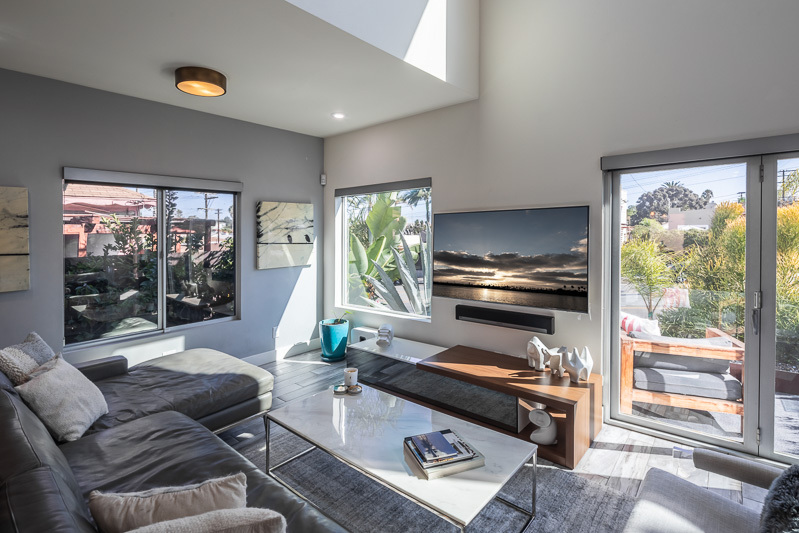 The main living area opens to a patio with a lap swimming pool and to a great deck with views to the historic Presidio Park. 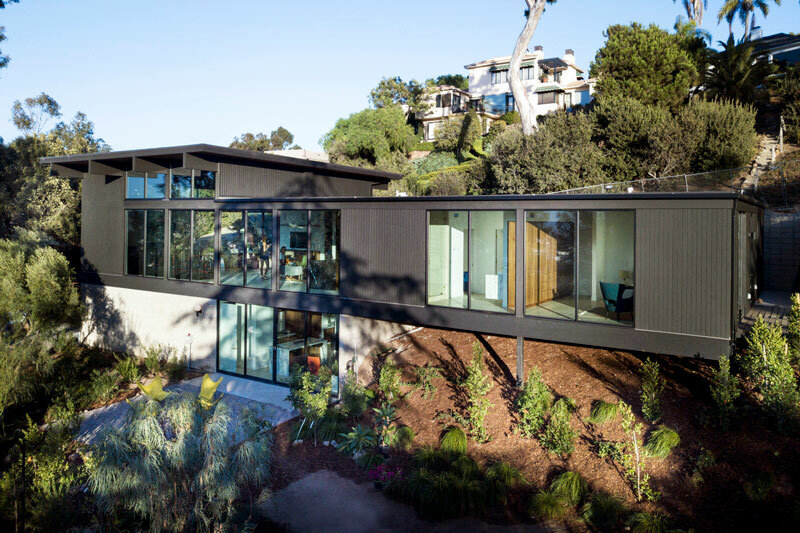 The building was designed using a cantilever building system to minimize site disturbance. When complete, it will have LEED certification, solar PV panels and a green roof. This project aimed to limit its hardscape area to take advantage of storm water have a diverse sustainable landscape. 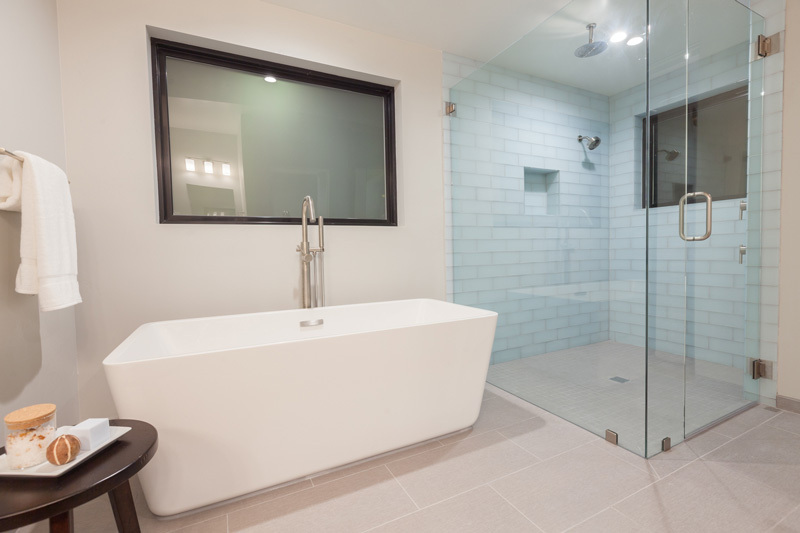 Architectural Design & Builder: Joseph Henseler, Duende Design + Construction Inc. 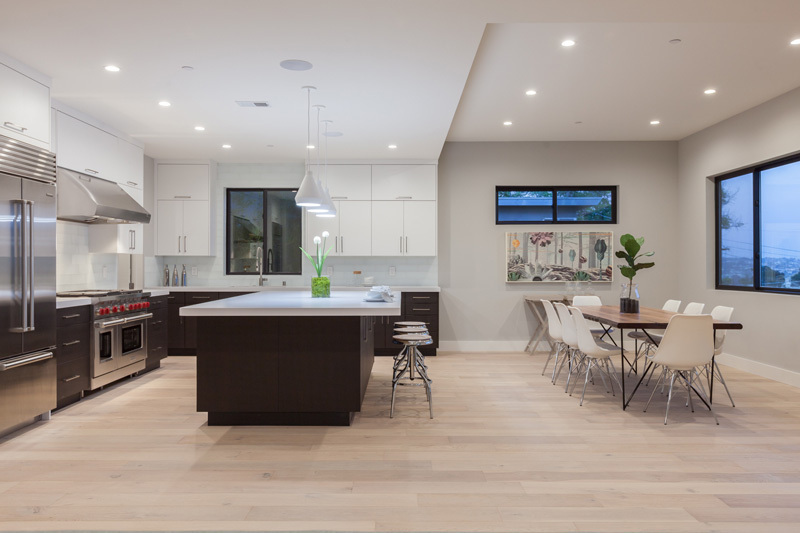 Images: Courtesy Duende Design + Construction Inc.
Role reversal! The spatial contents of this house were fully shaken up. Bedrooms that were in the rear were brought forward and the kitchen was moved to the rear so that the wall could be opened up allowing the main kitchen and eating area to spill out onto a large two-level deck. 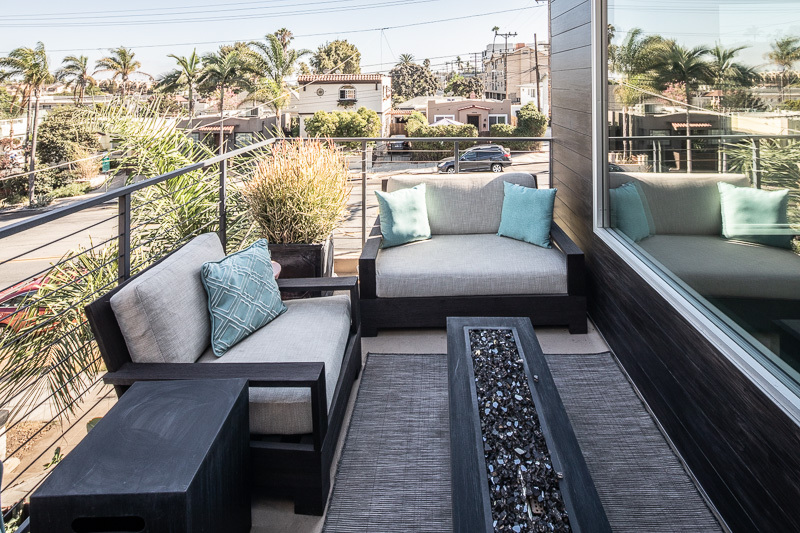 By opening the rear wall, 400 sq feet of deck could be added as an addition to the house without adding any actual interior square footage. 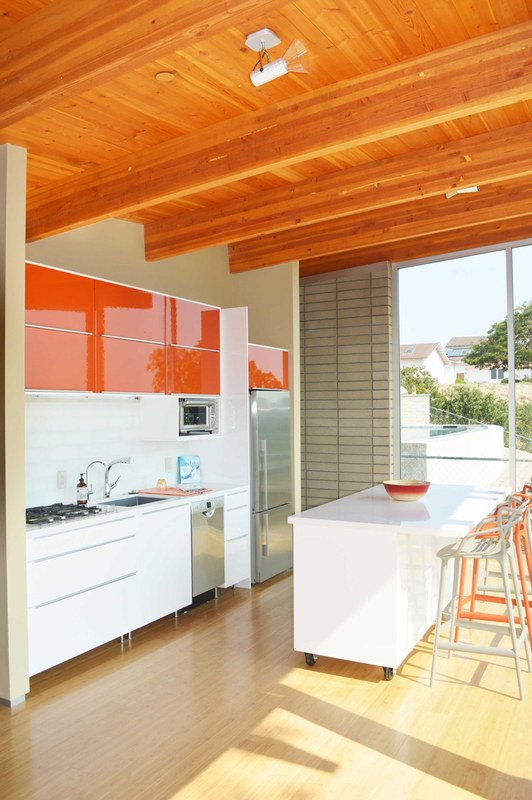 These owners with an active family love this house that is opened every day to allow the light and ocean breeze through their spaces. 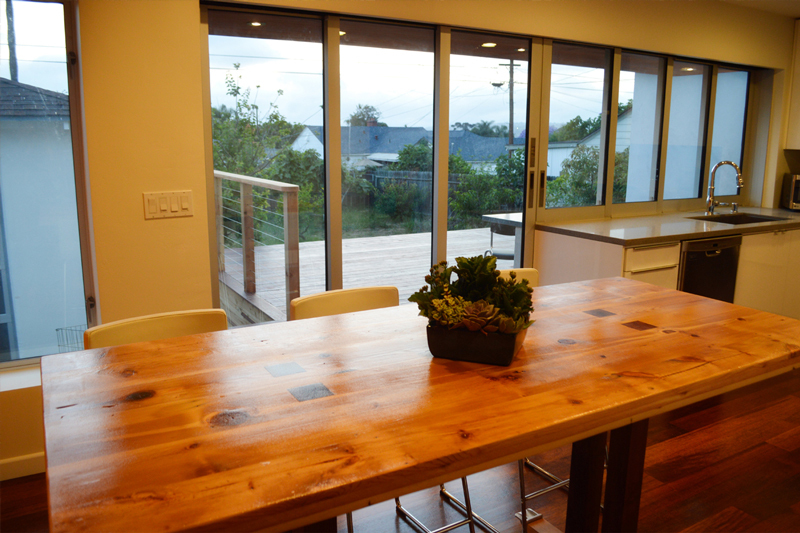 A custom kitchen table built from reclaimed wood from the old garage door is integral to the experience of the house as it can easily be wheeled out onto the deck. 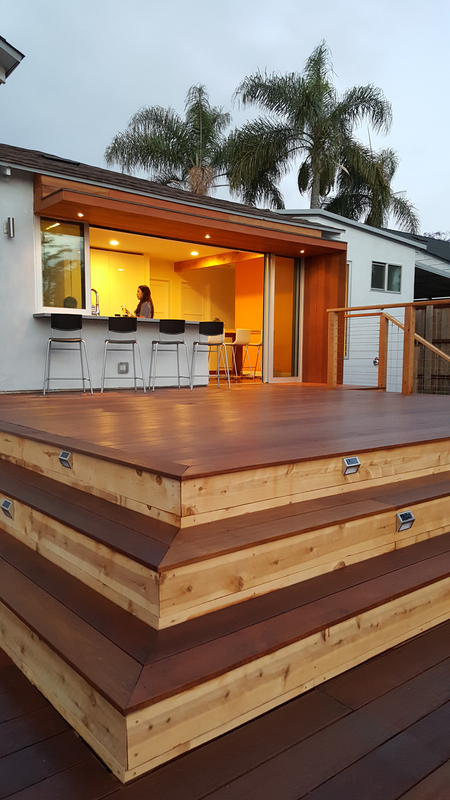 This deck has been constructed of the same beautiful Asian hardwood as the kitchen floor increasing the sense of this indoor-outdoor space as being one large contiguous area. 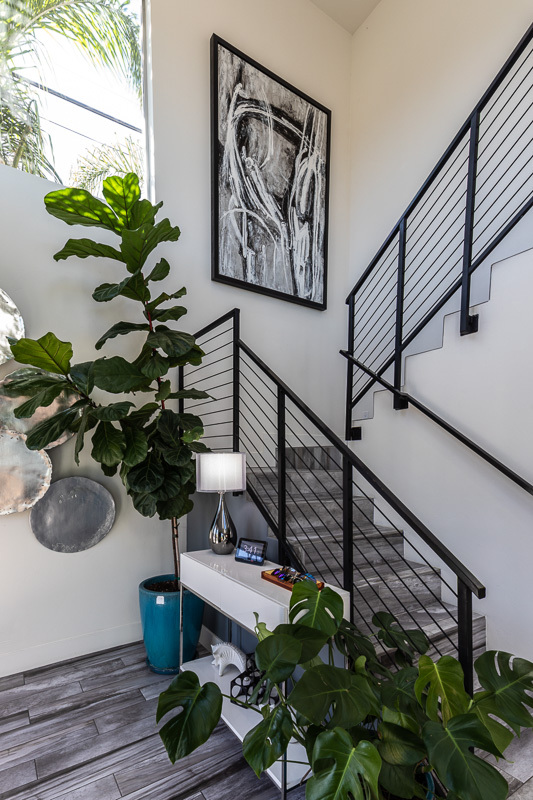 Modern detailing with a respect to the history of this house is seen throughout. 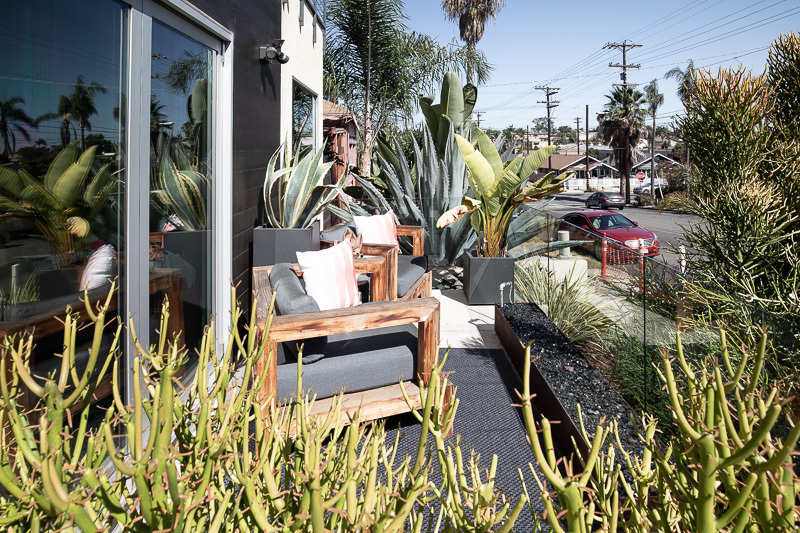 Leucadia, a beach town within Encinitas, is a Mecca for surfers and artists. 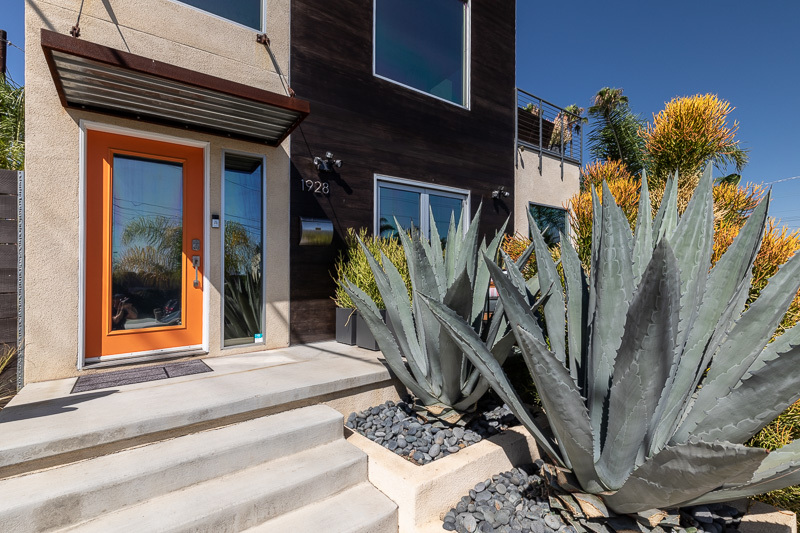 Sitting on top of a hill with the Pacific Ocean to the west, Batiquitos Lagoon to the north, and Mountain views to the south and east, this compound has astonishing 360° views. With an introverted courtyard, the L-shaped main building and Attached Dwelling Unit (ADU) both take advantage of the natural scenery. 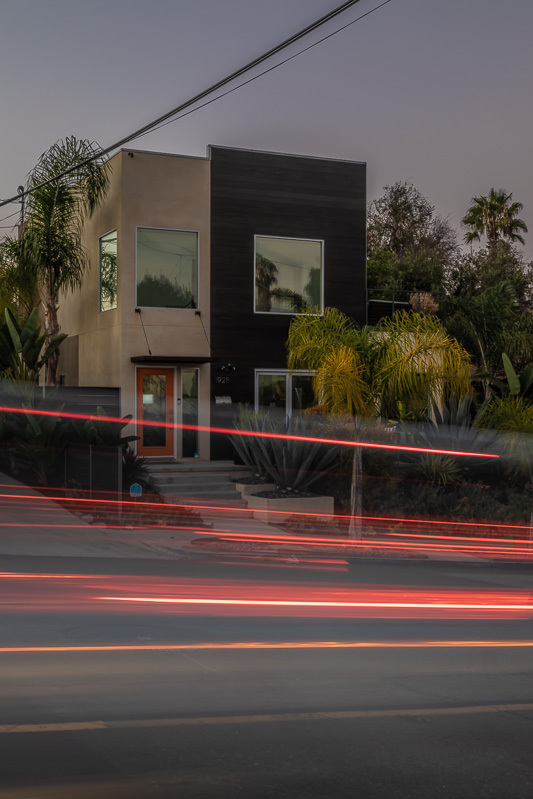 The home was conceived as a passive dwell. Winter heat from the south is allowed in, while summer heat is considerably blocked. 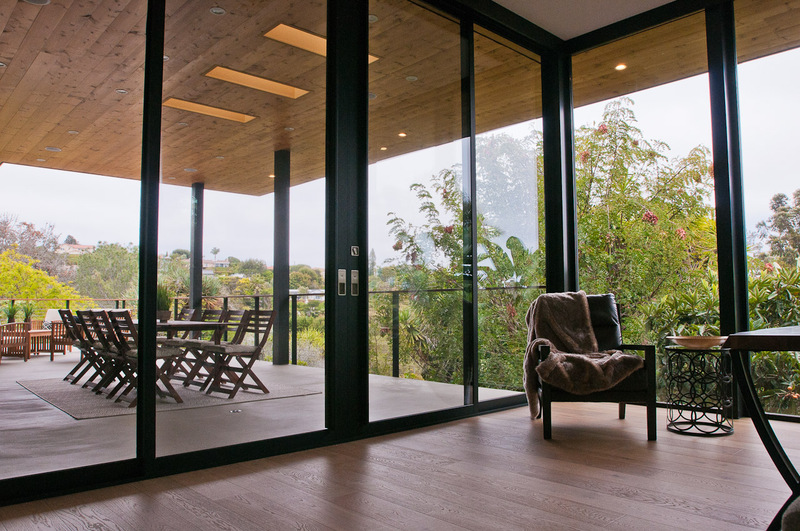 In addition, the home’s orientation naturally grabs breezes from the western ocean and eastern mountains. Cement board creates a rain screen façade on the main house, while cmu wraps around the guest house/garage. 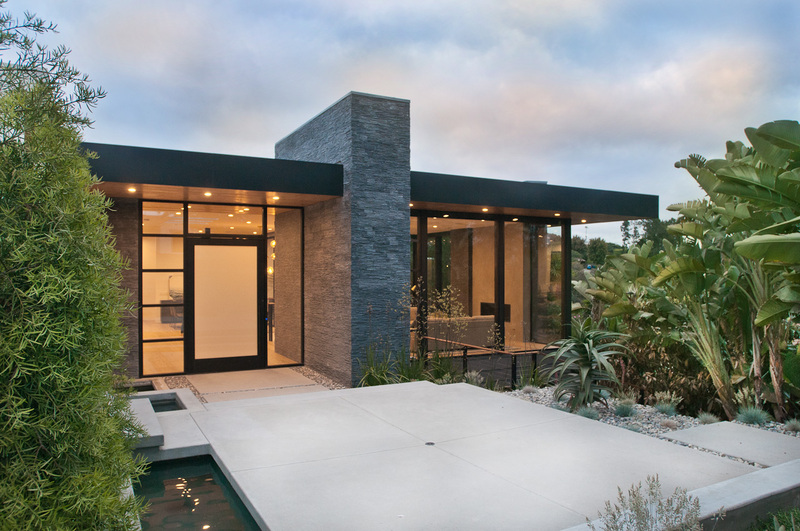 Aluminum rib exterior panels are used on the north, and floor-to-ceiling glass doors open the house to exterior courtyards and gardens. 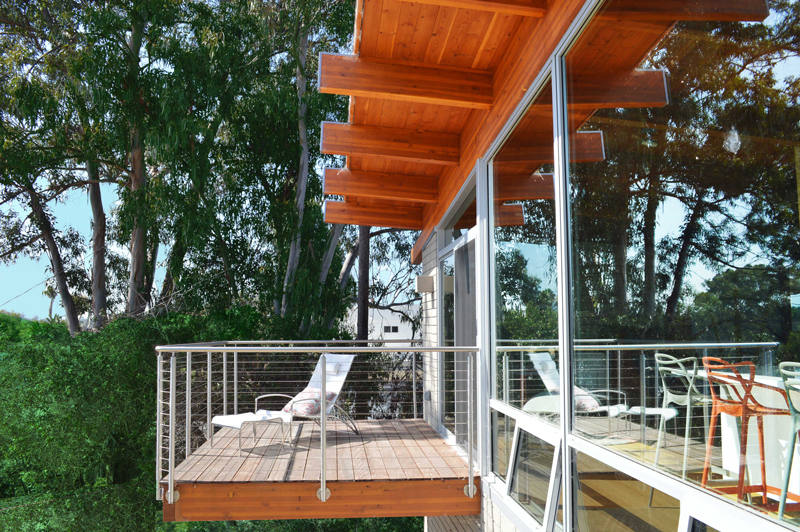 Exposed Douglas-fir glue lam roof beams support the roof and open to views of the Pacific and mountains. 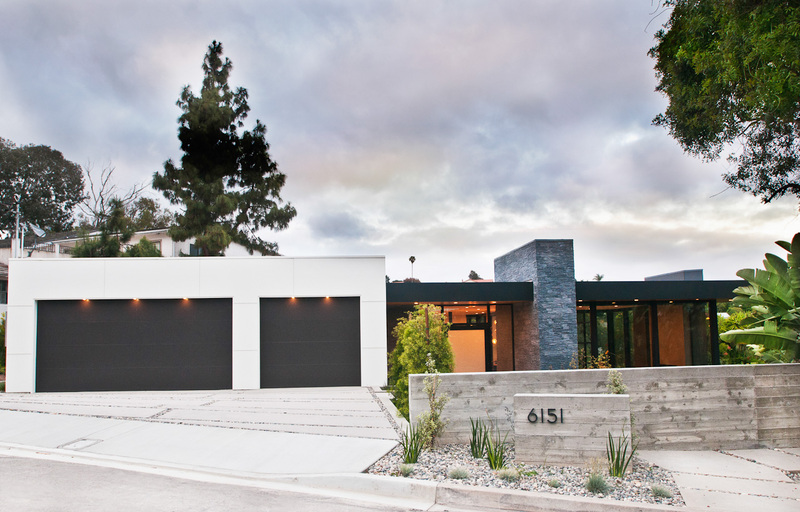 Site and climate are the main design factors this house responds to, inside and out. 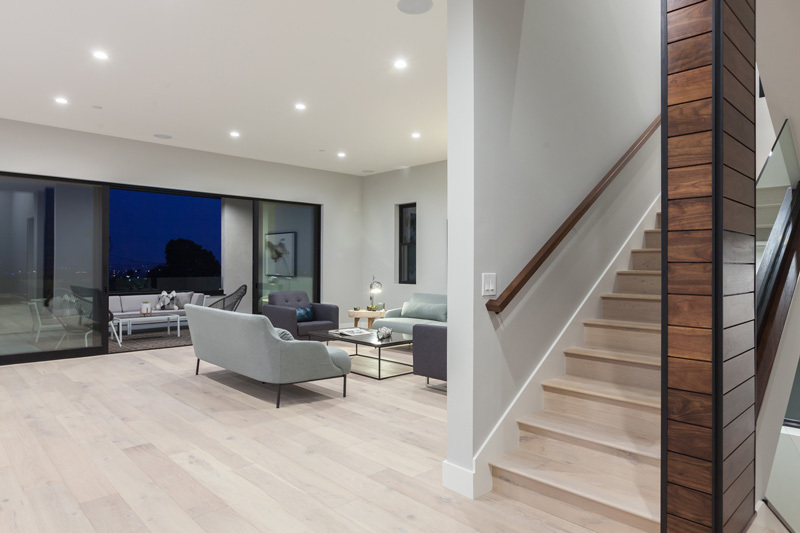 Natural materials like concrete and wood are native of California; bamboo flooring is from the Seattle forest program. 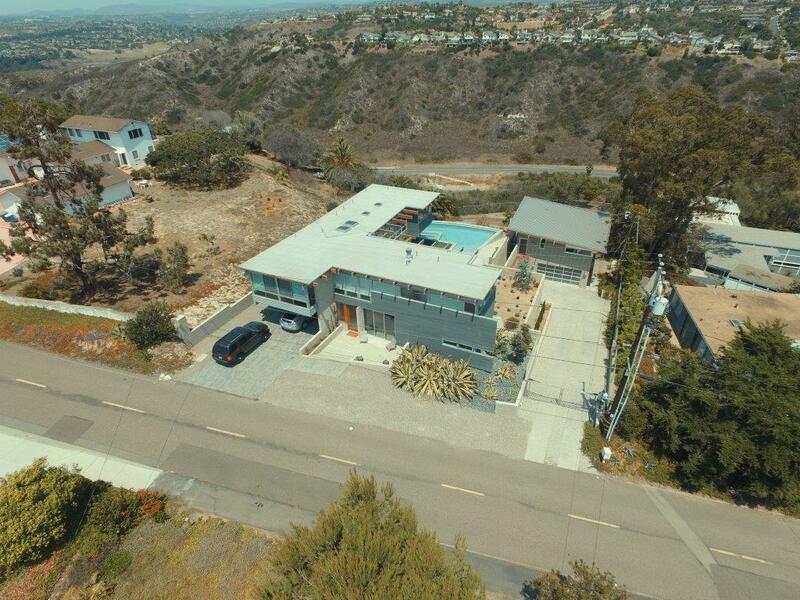 The 3,280 sf main home sits on a 40,000sf lot and includes an 572sf ADU with a 572 sf 2-car garage below. 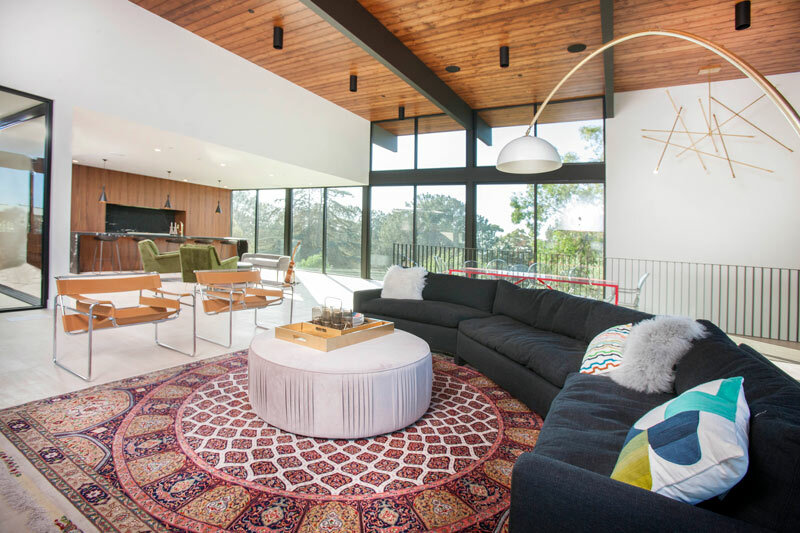 This 1950s tract house in the Bay Park neighborhood of San Diego has been entirely reimagined with an artistic nod to mid-century modern design. 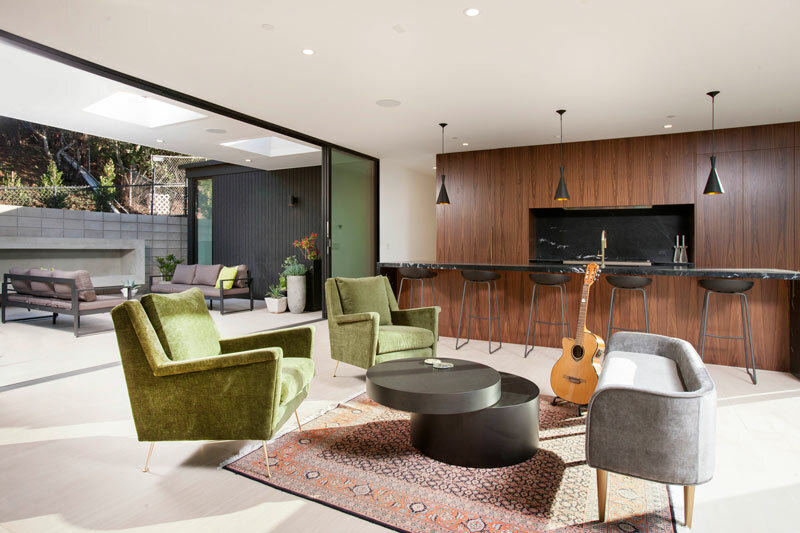 As renovators, Duende DNC continues to enrich its project portfolio producing work that is sensitive to the materials and details of the original house while instilling more timeless space design, detailing and architectural integrity throughout. 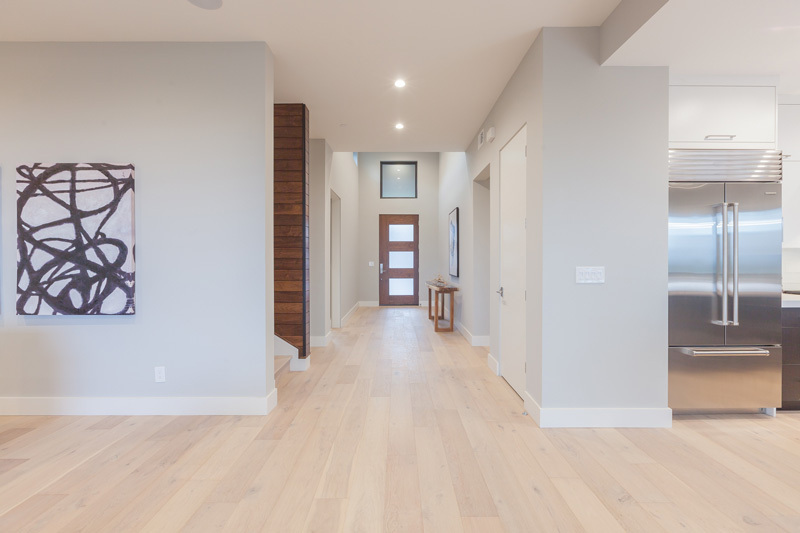 The new home entry sequence provides a refreshingly unique yet timeless and visceral experience so glaringly absent from most tract style homes. 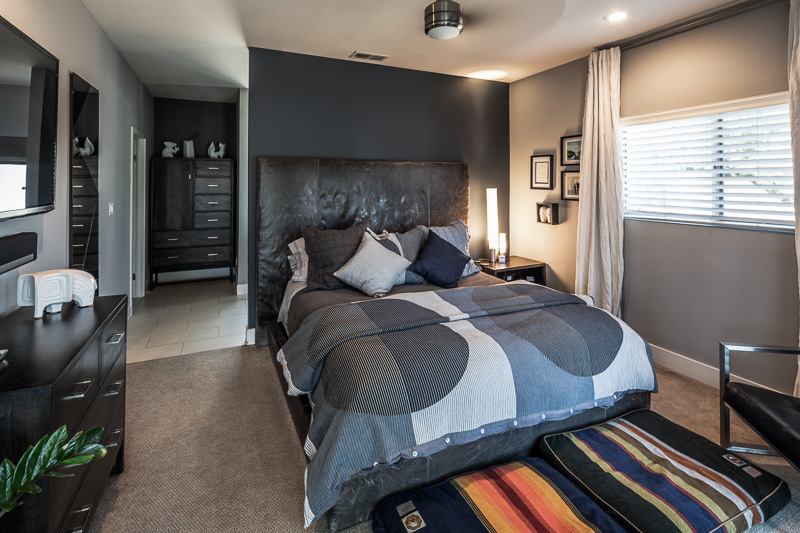 570 sq ft of new addition allowed the previous kitchen and living room combined to become an entire master suite. 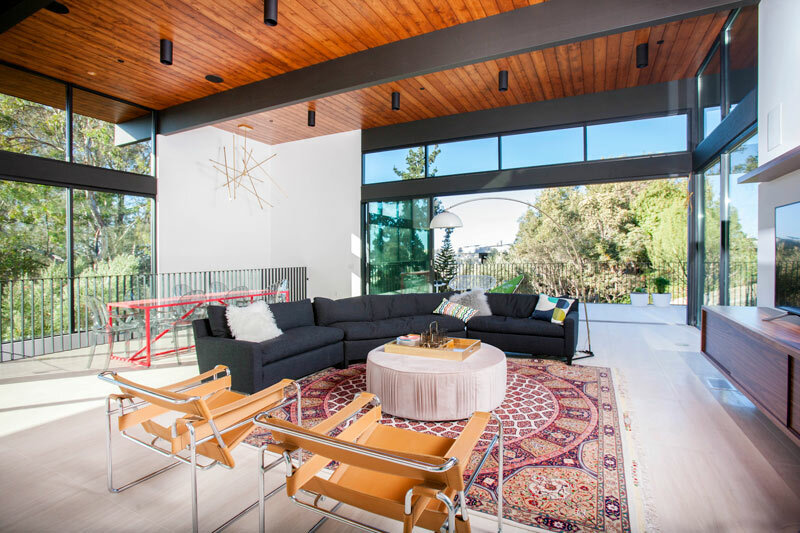 Exposed wood, open beams, freestanding masonry walls and repurposed wood reenergize this 60+ year old home. 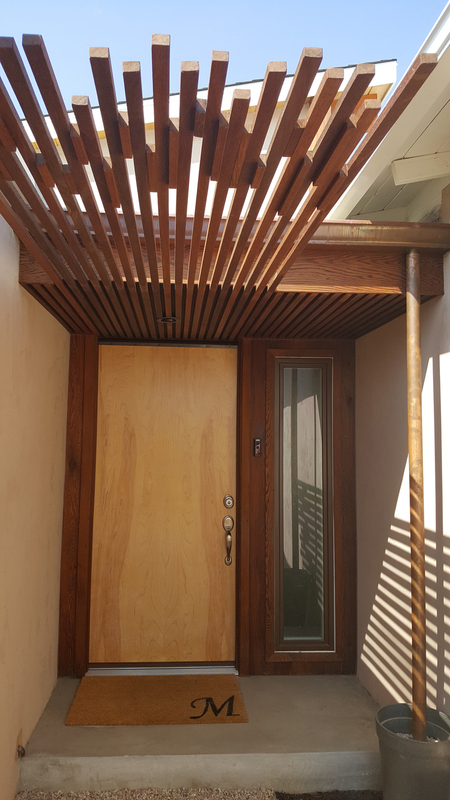 Most strikingly this location had hidden within the street facing facade large, beautiful old growth redwood planks and fascia boards which reappear in the new design liberated from their suffocation of years and layers of paint. Other architectural detailing includes the creative use of repurposed and salvaged wood, sculpture and furniture. 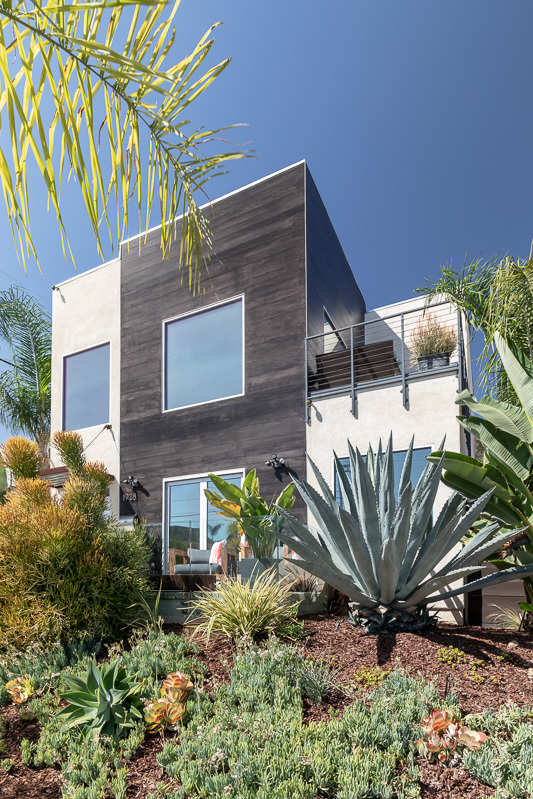 Stone Lion Properties and J Walsh Construction partnered to design and build La Pintura Moderna, a timeless modern retreat in La Jolla. 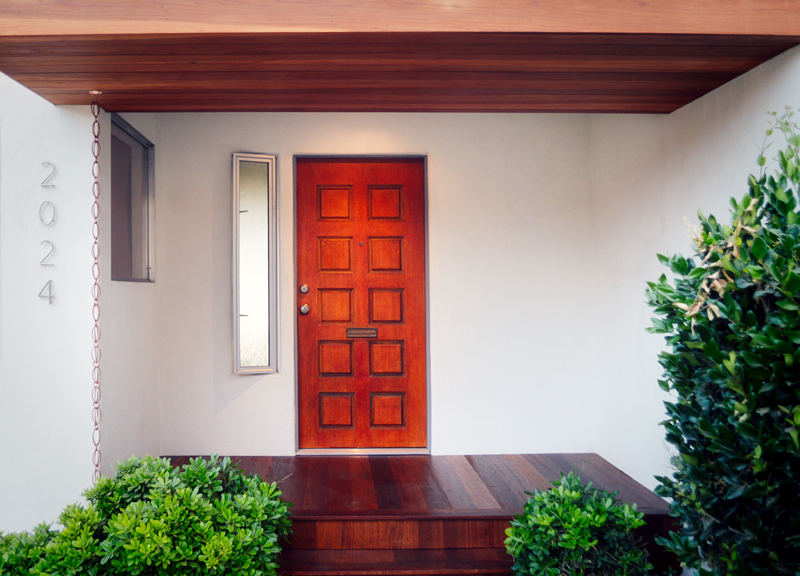 The design of the home achieves a balance between informed simplicity and sophistication. The 11 foot tall floor-to-ceiling glass walls frame the natural beauty which surrounds the home and captures the stunning canyon views. 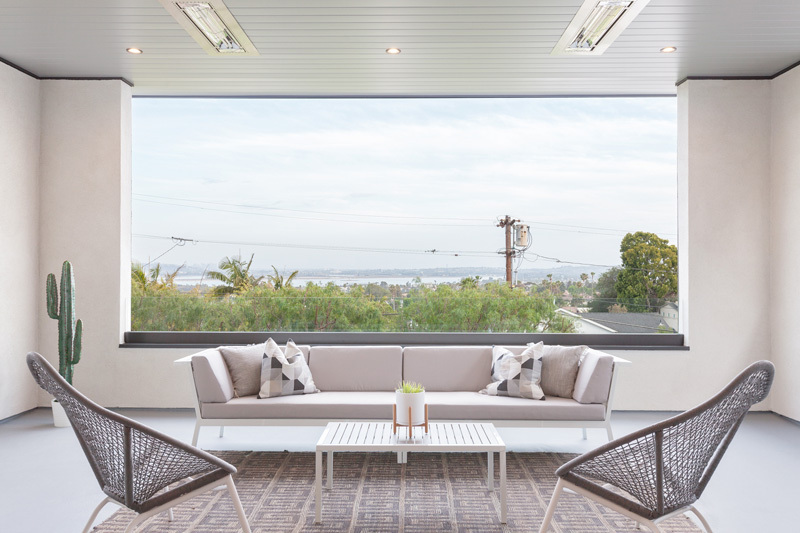 By extending the roof over the deck, an 800 sq ft outdoor living space is incorporated into the interior living area. 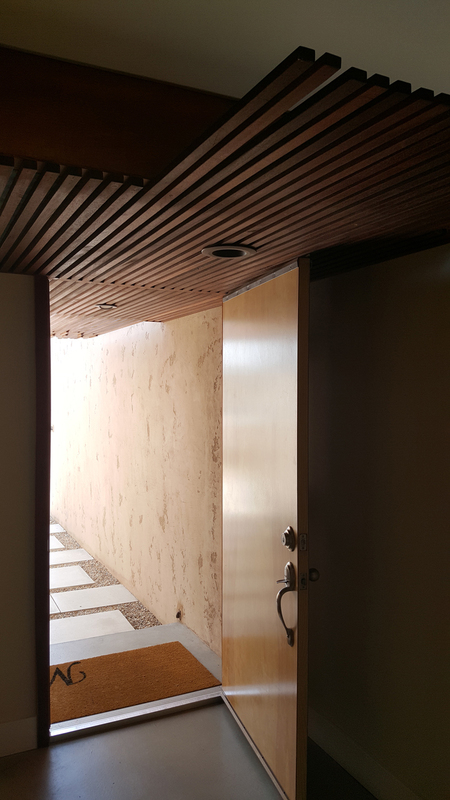 The overall result reinforces the connection between the interior and exterior. 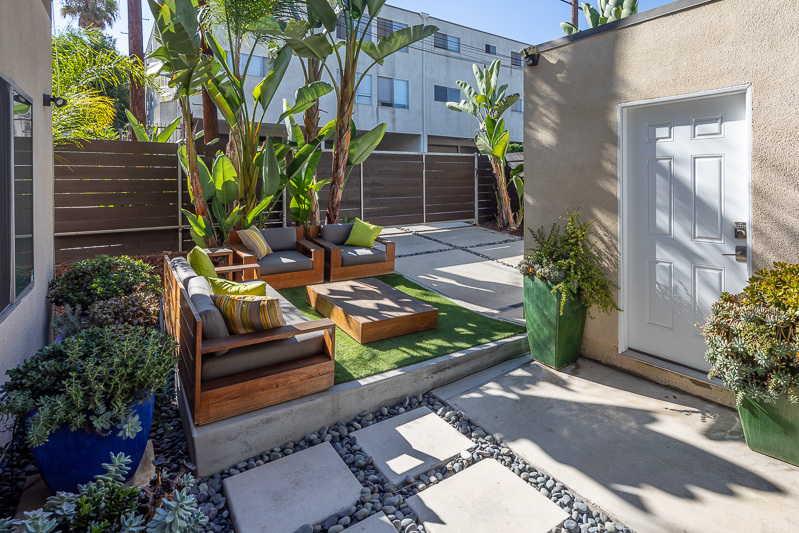 An entry courtyard with waterfalls and board formed concrete planters set a serene tone for the interiors. 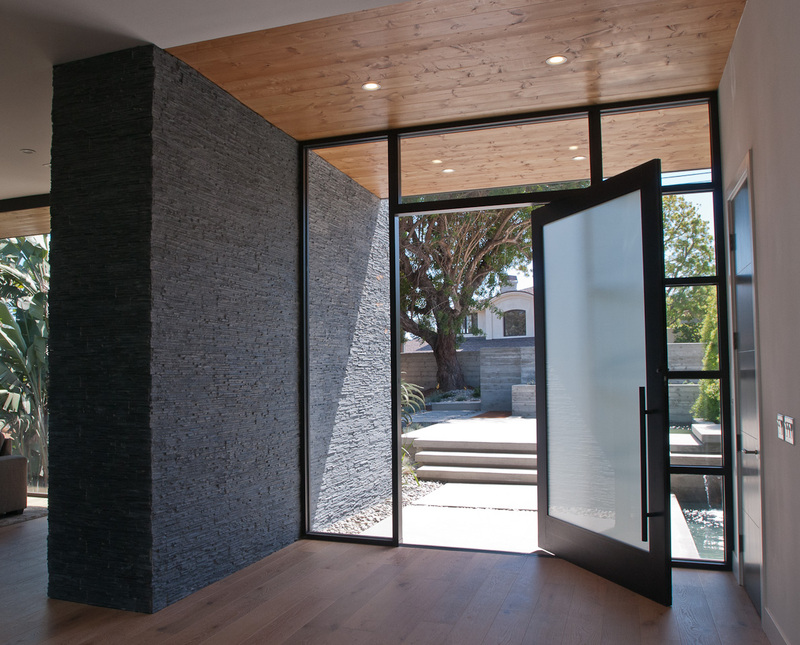 The 9 foot tall glass pivot door provides a fluid transition into the home, while the presence of a 16 foot moment wall, faced in natural stacked slate, grounds the structure. Repeating elements and a restrained color palette visually connect all spaces imparting a sense of calmness and well-being.